Sim Bowden has worked this corner in Chapel Hill since 1999. 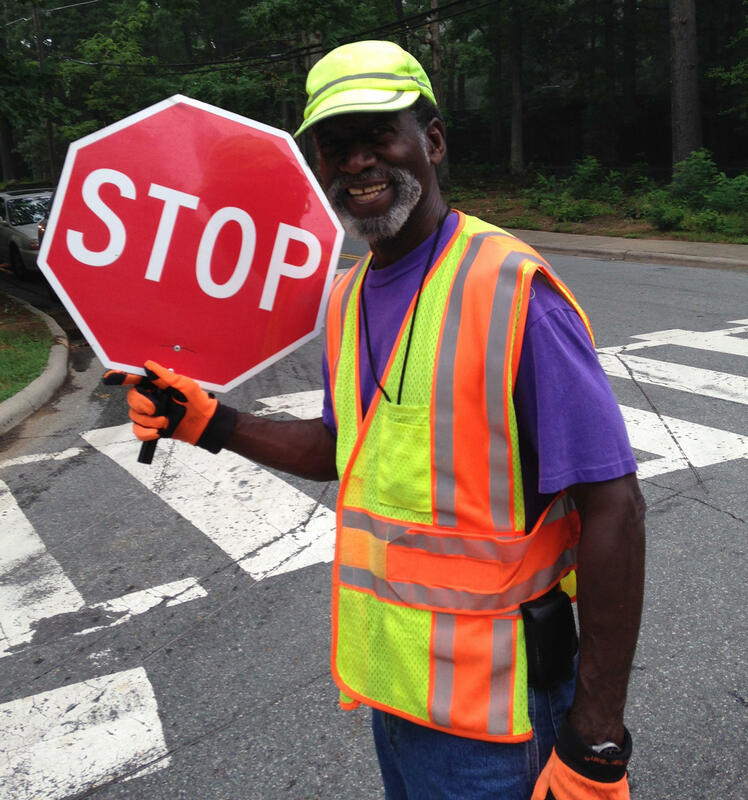 Every weekday, Sim Bowden manages the pedestrians at the intersection outside of Estes Hills Elementary in Chapel Hill. He's there for an hour and fifteen minutes each morning and afternoon, shepherding kids and adults safely across the busy street. Watching him is mesmerizing. His hand is usually in the air -- he waves to everyone, cars, trucks, school buses. And everyone seems to know Sim. "Hello, cutie," shouts a mom in a silver SUV. Today is the last day of school in Chapel Hill, and it also marks the end of Sim's fifteenth year working this corner. "I just enjoy doing it. The people are great. They're the ones that make it," he says. "The people." An 8th grader walks by. He's headed up the street to Phillips Middle School where he'll take part in the graduation ceremony. The young man is wearing khakis and a blue blazer. Sim takes a few minutes to chat with the boy, Henry. Sim looks Henry right in the eye, gives him a few words of confidence and adjusts the young man's tie before sending him off with a smile. Sim was assigned to the corner fifteen years ago. He moved to Durham after retiring from a teaching position in New Jersey. He's also done security work, and served in the National Guard. He remembers his first day as a crossing guard on Estes. It was busy, lots of cars. 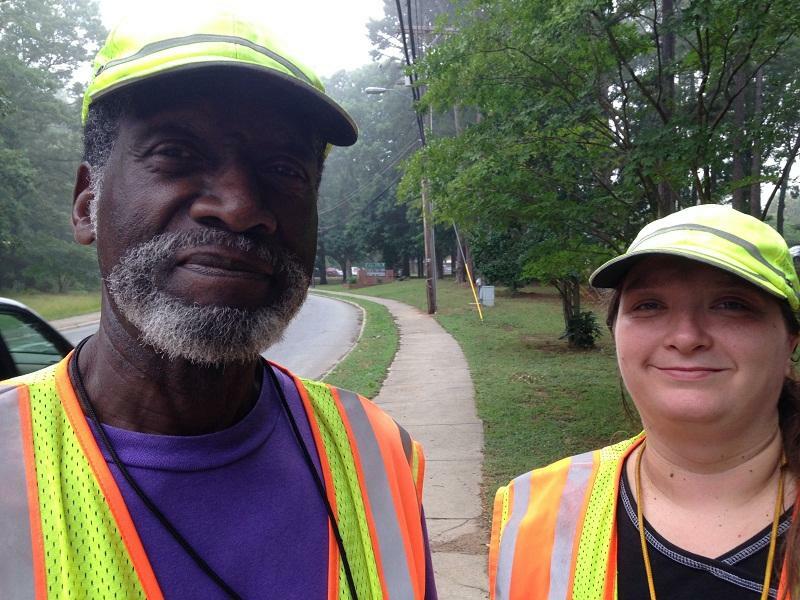 Then another crossing guard, a guy up the block, walked down and offered to switch with him. "I thought about doing it, but I didn't. And this is where I've been ever since." Oh, and when the sign says "No turn on red?" Don't turn on red. A couple of years ago Crystal Martinez-Ramos started working nearby. She ushers cars into the elementary school itself, about a block away. The two blow their whistles each morning, just to say "I've arrived, good morning." When things quiet down, Crystal heads down to talk to Sim. "He's so wise," she says. "If I have a problem at home, he'll give me an honest answer." They share things - sometimes Sim brings Crystal food that she could use, or clothes that would fit her son. She brings items to him in return. Crystal appreciates the priority that Sim gives to safety at the corner. During his hour, safety comes first and she emulates that. "I've seen so many deaths in my life," Crystal says. She saw her mother and her grandmother pass away. "We don't know what will happen in this world. My smile, my wave might brighten someone's day, or even be the last thing a person sees." On this last day of school for the 2013-2014 school year, Sim crossed the crosswalk to his car. He popped the trunk and took off his vest and his hat. He's been diagnosed with cancer, and he's headed to a doctor's appointment. He'll be back this afternoon for one last time this year. Crystal will be there as well. Carrboro High School sophomore Carolyn Macleod credits her third grade teacher Hannah Stang with her passion for writing. They have written letters to each other ever since Carolyn left Ms. Stang’s classroom at age 9. The StoryCorps mobile booth left Durham yesterday after a month of gathering conversations from North Carolina to archive at the Library of Congress.